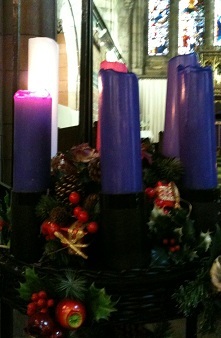 Advent. A time of anticipation. I am blessed to be married into a family of Christmas Pudding makers. There is a tradition to it. The same cream stoneware bowls are bought out from the cupboards and the creased, stained and repaired recipe, handed down through generations of the family is used. If there are children in the house they are each encouraged to have a stir of the mixture. Inevitably this is widened to include anyone in the house. The family is widely dispersed now and so to my knowledge this will be done in the same way in both Strathyre and at the north end of Cardigan Bay. Then the sixpenses are bought out – it used to be silver threepenny bits but they became very hard to source – and stirred into the mix. Muslins are tied over the bowls and they are put to steam in the large steaming pots. Cooled these Christmas Puddings are distributed around the family over the following weeks. Are they the best ever Christmas puddings? I don’t know and really it does not matter. They are a continuity, an ongoing tangible piece of love reaching across time and place. This entry was posted in reflections and tagged Advent, Christmas Pudding by nickmoz. Bookmark the permalink. Thank you Merrill. Food is important to me as my ever expanding waistline will testify – but food prepared with love will always taste the best.